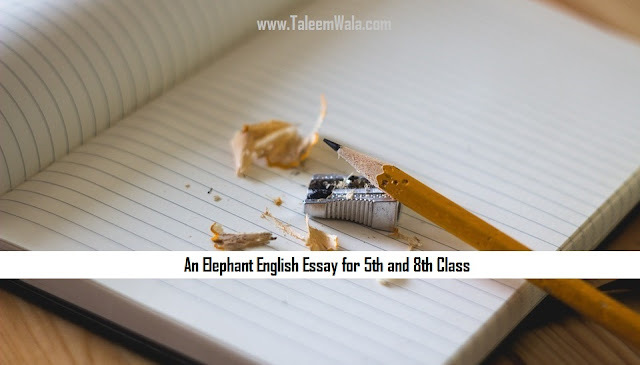 If you are looking for an English essay for kids or an essay on An Elephant topic for 5th and 8th class students in Pakistan then this page is for you. You can read or bookmark this page for later read and this is the original note on An Elephant Essay in English. Elephant is the biggest terrestrial animal on earth. It is found in the Asian, African forests of the world. It has a huge and awkward body. It has small eyes and a small tail. It has a long trunk, which is always moving here and there that helps it in keeping off the tiny insects. It has big ears like fans which keep its body temperature normal all day long. It feeds on sugarcane, fodder, leaves of the trees and twigs. Its baby is called a calf. It has two unique tusks. Their life can be measured with the help of the size of their tusks. Their average life span is about 70 years. They always walk in groups. The female elephant is called a cow. All the elephants protect and pamper their babies. They help each other in the hour of need. The weight of a fully grown elephant lies between 2,500 to 3,000Ibs. They can drink about 10 gallons of water everyday. They were also used in warfare in the past. It is also worshipped in some countries. They spend most of their time in bathing and eating. Hunters kill them for their tusks as their tusks are used to make valuable articles, jewelry and many other things. To get more essays like this you can search on our website or stay connected and we will update you with more essays.